Food is a defining element of any culture and medieval recipes are a great example of that. A medieval recipe reflects the culture of the people of its time. So it is that medieval cooking offers a wonderful glimpse into our past. Medieval recipes fed people from all backgrounds. However, social hierarchy and income had a huge bearing on what different people ate. The wealthy had a broader choice of meat and fish in their diet and even enjoyed tasty desserts. They often staged lavish banquets where exotic and unusual dishes were served. 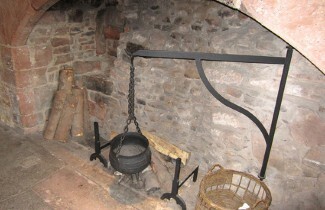 Conversely, the medieval poor had less choice and a simple pottage recipe with bread had to suffice. 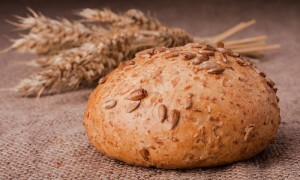 My recipe for barley bread is a good example of the kind of medieval bread they ate. Read more about medieval food and will you find it a fascinating subject. So much so that you will want to try out some recipes! It was a unique style of cooking which developed because of a certain combination: ingredients available in medieval Europe, the prevailing local climate and the lifestyle and limitations of the common people. If we look back through history, from Roman times to Renaissance Europe, food offers a great insight into people’s lives. Roman food is an amazing subject! What they drank is also relevant. 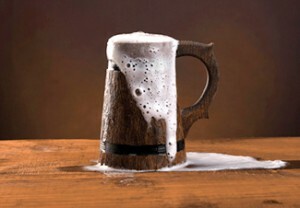 Ale was a much enjoyed, daily drink in medieval England! I find medieval Europe the most fascinating time in history. Especially, medieval England. On one side is the colour and romanticism of chivalric tales and feasts at lavish banquets. By contrast there was the harsh life of the common man who lived off the land. Thankfully, recipes from that era have prevailed and we still enjoy them today. 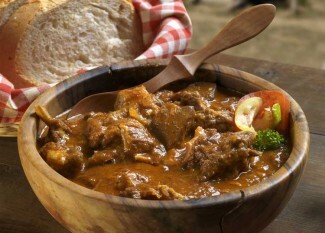 The beef stew in the photograph is a good example. If you love meat and red wine, try my medieval stew recipe. It has a touch of spice and one mouthful conjurs up medieval England for me! As a dessert, you might like to try my recipe for medieval gingerbread. A mixture of spices with honey makes you realize why our ancestors called it ‘ginger’ bread! Generation after generation have passed recipes down over the centuries. So, for that reason alone, we owe them a great debt of gratitude. You might ask why we should be grateful. The answer is simple – because our ancestors have given us an insight into their lives. I developed this website because of a passion for food, cooking and medieval history. My maternal grandfather understood the benefits of medieval herbs. 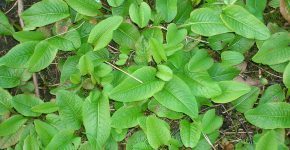 In 1930’s England, he often helped his family and neighbours with herbal remedies. It was a time when many people could not afford medical bills. He was a popular member of the local community – and would have loved my medieval beef stew recipe! The history of herbalism is an exciting subject but the cookery of medieval England as a whole is what interests me most. It forms the core foundation of my research and the content of this site. The majority of dishes date from 1300 to 1485 (the advent of the Tudor dynasty in England). In addition to actual recipes, the general subject of medieval bread was a must for me. I have always loved bread, especially home baked bread. So I learned about the different cereals which people used for baking medieval bread and how they baked it. Then I came across the wonderful, unusual names of medieval breads. Cheat, tourte, wastel, cocket and clapbread amongst others! Another surprising fact that came from my bread research relates to plates. The plates used by medieval nobles were not like the ones we use today. They were made out of brown bread! For more information visit my medieval bread page. Another of my favourite areas of research was what makes a medieval garden. After all, the successful cultivation of vegetables, herbs and other plants was a key factor in the food and cooking of 13th century Europe. A good medieval recipe must have ingredients to match. 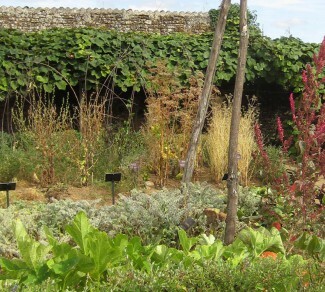 Many nobles had their own garden for the growing of vegetables, herbs, fruit and flowers. Usually split into quadrants, the garden would be a maze of colour in the spring and summer. After a good growing season, there was plenty of fresh ingredients for cooking a wide variety of recipes from stews to desserts and salads. 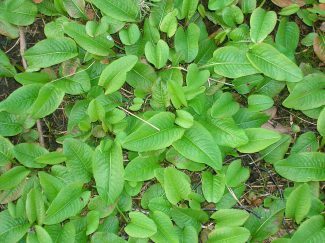 Many of the herbs and flowers also had a medicinal use. Therefore, the medieval garden brought more than just a culinary benefit. I have tried to create an enjoyable resource for anyone interested in medieval cooking. You might be a history student and interested in learning more about medieval life. Or perhaps someone who loves to cook and wants to experiment. 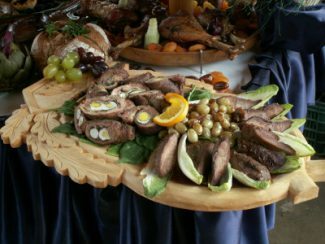 Maybe you own a restaurant, hotel or pub and want to expand your menu for special occasions. Any enthusiastic cook is keen to explore new culinary horizons. So, I hope you find some suitable inspiration here to create your own dishes! Not only that, but you might even go off at a tangent and delve further into a particular area. From baking to roasting, making salads and desserts to the growing of flowers and herbs. Behind every medieval recipe there is a wealth of interesting data. I regularly update this website, so feel free to bookmark it so that you can return in future. Also, I publish new photos and posts on my medieval recipes blog from time to time. If I come across an interesting story from the medieval era it will often spark off an idea in my mind. Connecting the subject of food to one of the most fascinating times in the world’s history is a delight! Therefore, whoever you are and whatever your reason for being interested in medieval recipes, I hope you find something of interest here.